Killer Characters: Baked Goodies Galore (calories included)! Baked Goodies Galore (calories included)! By Mel Gresham from the Haunted Yarn Shop Mysteries. Welcome to Mel’s on Main, your one stop shopping place for holiday treats. My staff and I have been working overtime to keep the bakery case full this holiday season. But wait, before you reach the counter, stop and close your eyes. Now, take a deep, deep breath and enjoy the warm smells of yeast and cinnamon and chocolate. Then go ahead follow your nose on over here for a free sample. Do you need a hostess gift? Or are you so busy running here, there, and everywhere that you don’t have time to do your own baking? Let us help you out. In fact, I’m going step back, now, and let the food do the talking for me. Do you see anything that looks good enough to eat? I love it when people pick up something to take home, but also when they take the time to sit down here with a cup of coffee or tea and a slice of something. I love hearing their reaction to that first bite. And I also love hearing the memories that flood back with the smells and spices – memories of home and favorite holiday treats – the cookies their grandmothers baked, the pies they helped their mothers make. What are you favorite holiday baking memories? Let me know in a comment below and maybe next year I’ll add that to the menu at Mel’s on Main. 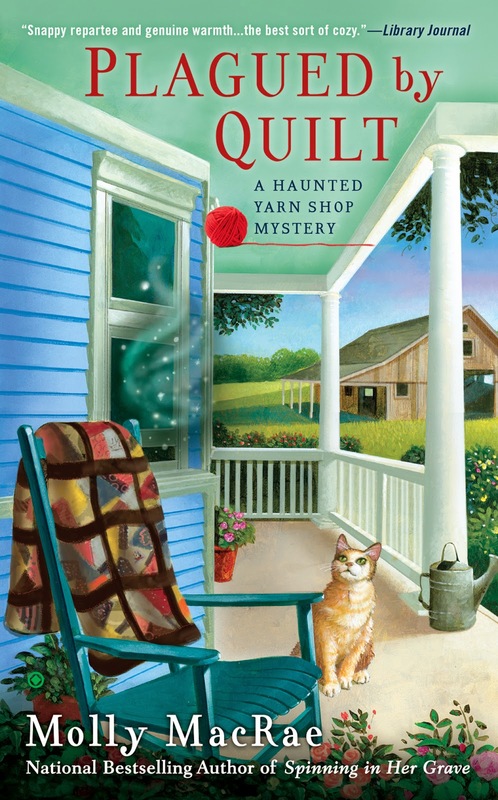 And three lucky commenters will win their choice of one of the Haunted Yarn Shop Mysteries. The books, in order, are LAST WOOL AND TESTAMENT, DYEING WISHES, SPINNING IN HER GRAVE, and PLAGUED BY QUILT. Every year it's cookies, cookies, cookies—sugar cookies, chocolate chip cookies, and oatmeal raisin cookies—it's not long before everyone is sick of cookies … at least for a while! Making sugar cookies and gingerbread cookies with the boys when they were young are some of my favorite memories. I love gingerbread. These days I sometimes still make them, but I don't bother to decorate them. I just eat them as soon as they are cool enough to touch. Vera Wilson said: Would bake a couple of fruitcakes. One for the holidays and one to slice up and freeze for later eating. Made the house smell so nice when baking. Making cookies with mom...iced tea cakes. I swear I could smell the goodies you posted. :) I loved coming home as a kid and seeing what treat mom had made for the day. My favorite, peanut brittle. I had a microwave version I got years ago which was almost as good. :) Salt, sweet, heaven. One of my favorite memories is making cookies with my grandma. When she moved to an apartment, she had a really small kitchen, and she used to put the wire cooling racks all over her big dining table in the living room/dining area. We made all kinds, but my favorite were her ginger cookies. My daughter and I baked cookies every December. My husband supervised. Now that he is gone (along with my mom and uncle who couldn't wait to get their supply of cookies) we don't bake any more. Everybody seems to be calorie conscious. The granddaughter had joined us when she got old enough to help. I miss those days of fun. Every year my daughter and I bake cookies together. My husband is the taste tester. I haven't done any baking yet this year, but last Christmas Eve my sister, niece and I baked seven different types of cookies. It was a LONG day, LOL. The time my son-in-law went wild for chocolate crinkle cookies cemented that as a holiday favorite. 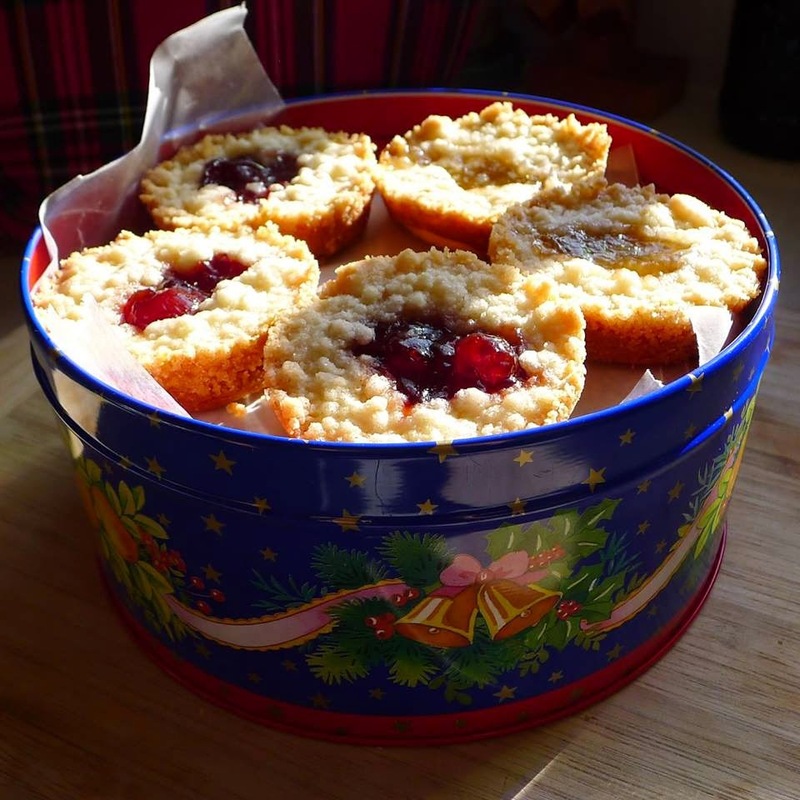 His grandmother had baked them, so he had lovely memories. Then there was the time we all got together and made gingerbread houses from scratch at my daughter's house and I made my own grandchildren, grandmother memories. They may not remember it themselves, but there are pictures! My e-mail is ncroessner@comcast.net. If I win a book I'd like to get the first one, so I can follow through with the others. Or, any one would be great. My grandmother made a delicious applesauce cake and my mother made apple slices and eclairs. They could both bake and cook so well they should have opened a restaurant with a bakery. I know I got my love of cooking from both of them. Baking with my grandmother---great sugar cookies---I just wish she would have left a recipe. I was born in Finland so when I was young my mom would bake delicious Finnish goodies. Baking different shaped gingerbread & sugar cookies with family. Everyone had their own favorite shape chosen again & again over the years. Most fun was year we created a train with coal car, caboose & pullman cars. We usually have rum cake for the holidays. I've made rum cake before and it's always very moist and delicious. We always had Chicken & Dressing, cranberry sauce, potato salad, deviled eggs, peas, beans, several pies----a feast!! Merry Christmas! Food and memories. Wonderful stuff. My mom made a fruit cake for non-fruitcake people. Chock full of dates, raisins, chocolate chips, pecans, and fresh cranberries (instead of maraschino cherries) with just enough eggy, buttery batter to hold it together. I've made it, but it isn't nearly as interesting. Not a holiday baking memory- but being with my grandmother when she made chicken soup. Nothing like the aroma with her "secret" ingredients. When I make it today, those memories come flooding back. Fruitcake...My Grandmother always made it homemade and delicious...also ambrosia which is something you don't hear much about. My mom was a terrific baker anytime of the year! When I was a kid, my fondest memories in regards to baking would be when she, my sister and I would make cut out Christmas sugar cookies and decorate them with colored, buttercream frosting. I have followed in her footsteps and have done these with my kids and grandkids now for over 30 years. Merry Christmas & Happy Holidays to all! 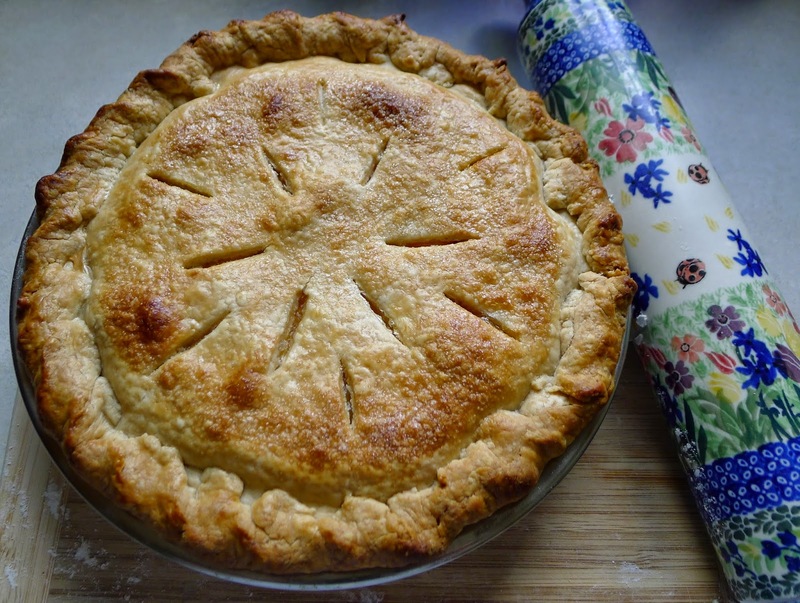 My favorite holiday baking memory is learning that there was no meat in my great grandmother's mincemeat pies. And they were delicious! I recently found out that Oliver Cromwell once banned mincemeat pies when he was in power and so now I can honestly say that I was a rebel since childhood, even though that law has been repealed for years. The food looks good. I thought that was banana bread in the picture. I love pumpkin pie and also chocolate and cinnamon. I've been thinking about chocolate cookies. My Mom was always baking. Every day she would make several types of cookies....the aroma when you walked in the door was amazing. My mouth is watering just thinking about it. My mom made the most wonderful fruitcake. It wasn't the gooey kind that most people think of when you mention this treat. Hers had a more cakelike batter and had fruit and pecans. I loved citron in it. She even made a chocolate version. We had to let it age in the refrigerator for a couple of days before eating it. I was so impatient that sometimes mom would cut me a small piece once it cooled. We put a slice of this fruitcake and a glass of milk out for Santa on Xmas eve before going to bed. I miss fudge from mother and mother-in-law. Not the same when you make it yourself. Making gingerbread cookies for juvenile hall kids. I'll take a piece of that Caramelized Upside-down Pear Tart please! When I was a kid, I'd always help my mom make Christmas cookies. I was the decorator of our Kris Kringle cut out cookies-no frosting, just sprinkles! Now my friend and I have a tradition-I go to her house and we bake lots of cookies for her family and me! I have a peanut butter date ball recipe that my boys love. I had to hide them in order to have any left for Christmas. My mom making her sweet potatoes pie. This may be a duplicate? I used to love baking Christmas cookies. Most years we bake different things but we always have peanut butter kiss cookies. I like to make them with my kids. It makes it really feel like Christmas. This year my grand nephew in Montana helped his grandma bake. He loved messing with the flour as I could tell from pix on FB. Wish I could have been there. Drat you and that rosemary/dark chocolate cake and your carmelized pears too!!!! I'm doomed to go grocery shopping now! As a child, I loved when my mom baked Christmas sugar cookies (using Christmas cookie cutters). Then we would use food coloring to "paint" the cookies which was fun. My favorite baking memory is my grandmother then mother and now me baking paska - a Polish yeast bread made with sugar, butter, vanilla and eggs and flour of course It's great with butter and/or ham. Traditionally we serve it as a first course on our special Christmas Eve dinner. I'd take a piece of everything if I had a chance. It was quiet here so had basic. DH been eating up the goodies almost faster than I can make them. The Rasin Cinnamin Bread lasted longer than anything else.As for the book I'd like If I win, Unholy Matrimony would be great. BTW, I snuck some chips and onion dip in, nobody seemed to notice but everybody sure seemed to help themselves. Have a Happy New Year.